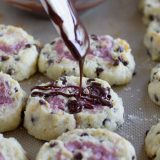 Great for a sweet breakfast or treat, these Chocolate Chip Biscuits with Raspberry Cream are light and tender biscuits, studded with chocolate chips and filled with a raspberry cream. The chocolate drizzle takes them over the top! Preheat the oven to 450ºF. Spray a large baking sheet with nonstick cooking spray or use a silpat liner. In a small bowl, beat the cream cheese until smooth. Add the raspberry jam and continue to beat until completely combined. Set aside. In another bowl, combine the flour, baking powder and salt. Add the butter and cut in until it resembles coarse crumbs. Stir in the mini chocolate chips. Add the buttermilk and stir just until all of the ingredients are combined. Turn the dough out onto a floured surface. Sprinkle the top with flour, and work it just until it is no longer sticky. Pat the dough out into a 12×8” rectangle, about 1/2” thick. Spread the filling over the dough. Starting with the long edge furthest away from you, start to roll the dough jelly roll style, ending with the seam side down. Use a bench scraper if necessary to help roll the dough. Even out the thickness of the roll with your hands. Cut the dough into 16 equal-sized pieces. Place on the prepared baking sheet, cut sides up. Bake in the preheated oven until lightly brown, about 15 minutes. Remove and allow the biscuits to cool. To make the glaze, combine the chocolate chips, cream and milk in a small microwave safe bowl and microwave on half power in 30-second increments, stirring frequently, until the chocolate chips are soft. Stir until smooth. Alternately, use a double boiler to melt the chocolate. Drizzle the biscuits with the chocolate glaze.